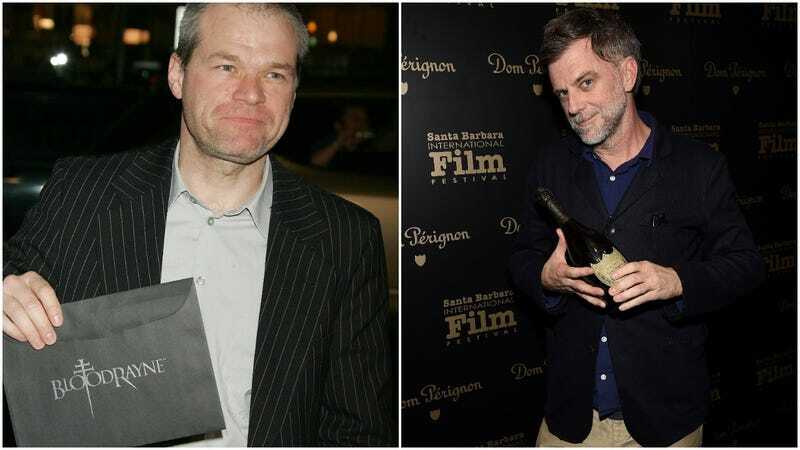 It’s been a minute since we’ve heard from Uwe Boll, the critic-punching video game movie auteur whose film-making career once pushed the furthest boundaries of the German tax loophole system. But while Boll has now retired to be an obnoxious restaurateur, instead of an obnoxious film director, he still likes to keep his hand in the game, it seems. Hence a tweet he issued tonight, accusing director Paul Thomas Anderson of bearing a grudge against him, one so powerful that it shaped the marketing efforts for Anderson’s latest film, Phantom Thread. Specifically, Boll is accusing Anderson of intentionally ripping off the poster design for his 2005 schlockfest Bloodrayne, a film Michael Madsen once described to us entirely in terms of its merits as a good way to take a cheap family vacation in Transylvania during filming. Boll says Anderson was clearly outraged by criticisms he levied against him during a recent podcast, because listening to hours of Uwe Boll’s meticulously recorded and mellifluous speech is exactly what Anderson is doing with his dwindling time on earth. But hey, let’s be fair here: Man’s got a point about the overlapping poster designs. Both show a young woman standing in front of the faded profile of an elegantly dressed, Oscar-winning actor (Daniel Day-Lewis for Phantom Thread, and an extremely slumming Ben Kingsley in terms of Bloodrayne.) Both feature the film’s names in slightly gothic fonts. Both could presumably be held up with thumb tacks or tape, were one to print them out. Still, there are differences, too; Vicky Krieps has clearly failed to bring her vampire-hunting weapons to the poster photo shoot (a classic rookie vampire hunter move), and only one of the broadsheets bothers to address Meat Loaf by his full Christian name (Meat Loaf Aday). There’s also the fact that, if P.T. Anderson was going to pick a fight with a director best known for crappy video game adaptations, Boll wouldn’t even be at the top of the list; after all, Anderson’s still got unresolved beef to handle with his nominal doppelganger, Resident Evil’s Paul W.S. Anderson, first.